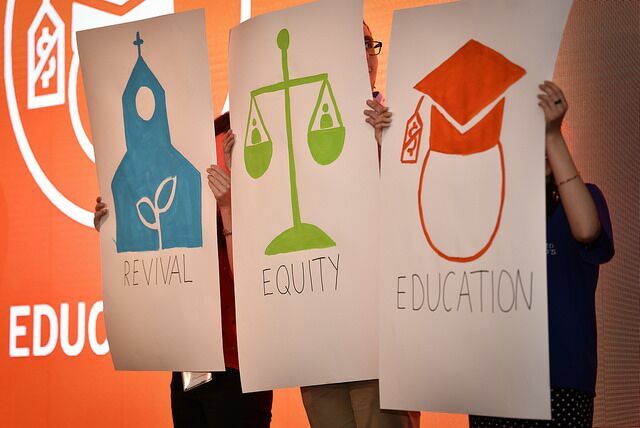 Youth participation is a crosscutting priority for the Lutheran World Federation.We want young people have a place and voice in all aspects of church and communion life. The LWF Youth Desk is based within the Department for Mission and Development but works with all departments. Specific activities are implemented with the desks for ecumenical, international affairs and human rights, public theology and interreligious relations, Women in Church and Society and with the Department of World Service (peace, climate justice, migration, humanitarian work). "We affirm the current efforts for climate justice through activities, such as #fastfortheclimate and the work done toward increased youth participation within the communion. These initiatives will continue as cross -cutting themes. Moving forward, we have named three key priorities to shape the next phase of LWF Youth work: the revival of churches, equity, and education." Read the full 2017 Youth Message to the LWF Twelfth Assembly. "Youth who made the LWF communion- Testimonies and stories from 1947 to 2017"
"LWF Global Young Reformers Network- The Exhibition"
Youth participation is a crosscutting priority for the Lutheran World Federation.We want young people to have a place and voice in all aspects of church and communion life. The LWF Youth Desk is based within the Department for Mission and Development but works with all departments. Specific activities are implemented with the desks for ecumenical, international affairs and human rights, public theology and interreligious relations, Women in Church and Society and with the Department of World Service (peace, climate justice, migration, humanitarian work). Young people are front and center of who we are, and what we want to be and do as a Lutheran communion. They are shapers of the life and work of the LWF. We continually draw new inspiration and energy from our younger members. They call us to change and to be relevant for future generations. We want young people have a place and voice in all aspects of church and communion life. Strategic planning | Youth participation is one of the four cross-cutting priorities guiding our work up through 2017. 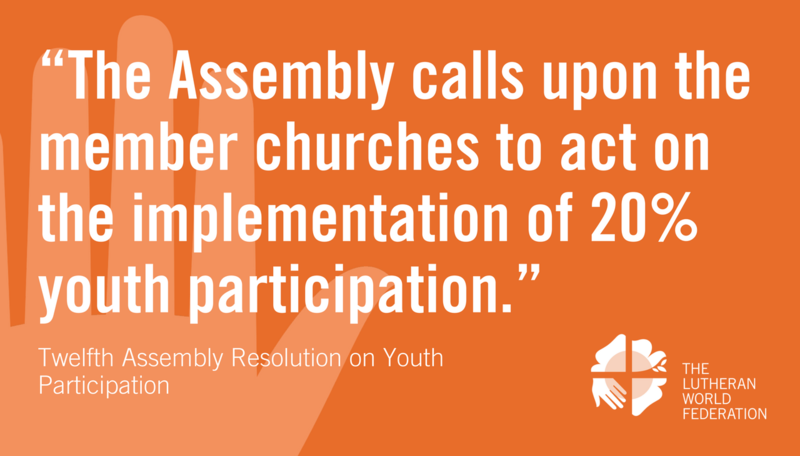 Programs with, for and by youth | We plan, run and accompany programs in youth advocacy, youth leadership, youth participation, and youth and Reformation 2017. 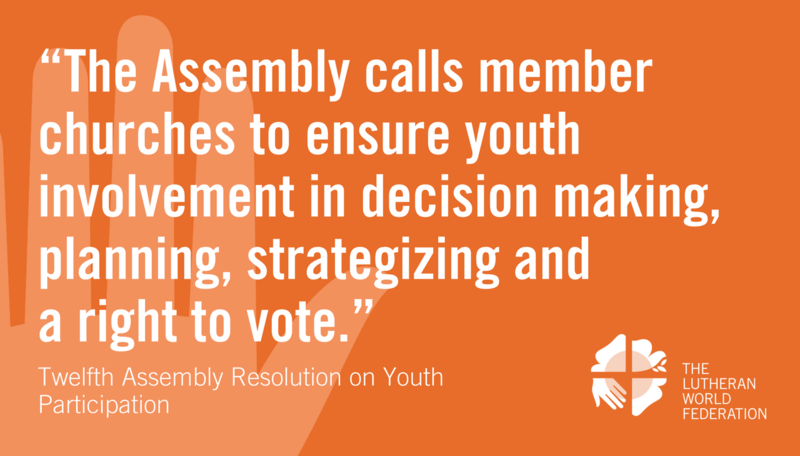 Decision-making and Representation | Young people under the age of 30 make up at least 20 percent of all our governing bodies. One fifth of participants at LWF events are youth. Leadership training | Our LWF Youth Desk trains and accompanies young leaders through seminars, workshops, intergenerational encounter, virtual conferences, social networking, toolkits and publications. Mapping | We want to make youth participation easier and even more meaningful so we are taking an across-the-board look at how young people are involved in the life of the communion and where there might be room for improvement. Internships | We walk with young people during their experience as interns in the LWF Communion Office.